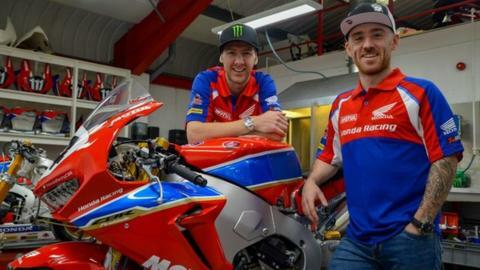 Sixteen-time winner Ian Hutchinson will compete for a new-look Honda Racing at the Isle of Man TT races in 2018. He will be joined by Northern Ireland's Lee Johnston to compete aboard the Honda Fireblade SP2 at the TT, Ulster GP and NW200 events. Both men will represent the team in Superbike and Superstock classes. Yorkshire racer Hutchinson, 38, has not competed since crashing and fracturing his femur in last year's Senior TT while leading the race. He is still receiving treatment, having previously endured more than 30 operations on his left leg after an accident in 2010, which happened after he made history with the Padgetts Honda team by winning five solo TT races in the same year. His accident led led to a five-year absence from the sport, but he then returned to win eight TT races. Hutchinson said: "I'm really looking forward to getting started with Honda Racing; it's a new challenge and a fresh start for me. "I'm confident that come the New Year we can get started and start aiming to be where we want to be." He and Johnston will take over from John McGuinness and Guy Martin for the Honda team. Former National Superstock 600 Champion Johnston made his TT debut in 2012 and has earned two podium finishes. "I'm probably the most excited I've been in years," he said.